Explore, picnic, hike and visit some friendly farm animals at the newly opened to the public Tolay Lake Regional Park in Petaluma. Here are our picks for a variety of events and other activities for children and families this weekend. Find more events for the whole week in Marin and beyond in our Family Events Calendar. You may be familiar with Tolay Lake Regional park from the annual Tolay Fall Festival in October, but did you know it's now open to the public seven days a week? We paid a visit to this amazing park near Petaluma this week and had a great time exploring the trails and taking in the spring scenery. It's a great destination for a family outing, with picnic areas, miles of paths and trails, and even some friendly farm animals to visit. Admission is free, but there's a $7 per car parking fee which is waived for Sonoma County Regional Parks members. Find out more here. We all know how crucial bees are to our food supply, gardens, and beyond. Shouldn’t we learn more about the importance of these fantastic creatures? Come chat with a real Sonoma County beekeeper and learn more about these amazing insects. Museum admission applies. Location: 1835 West Steele Lane, Santa Rosa. Event details. Get in touch with your inner engineer and build with colorful Lego! We bring out our collection of over 10,000 bricks, and kids can build whatever they imagine. Event details. Kids in Kindergarten through 6th grade are invited to learn about the importance of wildlife conservation with high school student volunteers. They will show videos, lead art activities, teach science, and play games with young nature activists. Free. Location: 110 Tunstead Ave, San Anselmo. Event details. 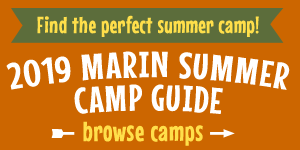 Come join the YMCA in the Marin Headlands for a weekend of family activities and fun. Our program will begin with a Friday evening check-in and dinner and end with lunch on Sunday. All meals from Friday dinner through Sunday lunch, as well as dorm accommodations for the entire family of up to 5 people, are included. Prices start at $320 for the entire family. Register here. Location: 981 Fort Barry, GGNRA, Sausalito. Event details. This community flea market is held indoors, rain or shine. Admission is free and treats from the snack bar will be available for purchase. Come shop for unique treasures! Location: 1560 Hill Road, Novato. Event details. Enjoy the best local and organic produce, flowers, pastured meats, seafood, organic cheeses, yogurt and milk, breads, baked goods, pasta, confections, olive oil, and brunch and lunch offerings! Kids can take a pony ride and visit the petting zoo (10 am–2 pm), try out some arts and crafts (9 am–2 pm) and kid's storytelling, 9:30–10:30 am. Event details. Celebrate spring at San Francisco Recreation and Park’s annual Eggstravaganza event at Sharon Meadow in Golden Gate Park. This family-friendly event features egg hunts, carnival rides, games, live entertainment, kids’ activities and free Mobile Recreation activities, including BMX bikes, climbing wall, skateboards, and more. Free. Location: 320 Bowling Green Drive, Golden Gate Park. Event details. Bring the family to the 3rd annual, all-day Tinkerfest designed to inspire and reveal the tinkerers and inventors in everyone. Tinkerfest will bring together makers, artists and tinkerers from the Bay Area and across the US to showcase their work while inviting the public to join in the DIY fun. Cost: Tinkerfest is included with regular admission; Adult: $22, Youth (ages 3 -12): $14. Location: 10000 Skyline Blvd. Oakland. Event details. Enzo Garcia plays guitar, banjo, accordion, musical saw, Jew's harp, enzotar, Appalachian dulcimer, slide flute, percussion and more. Recommended for children 7 and under. Drop in any time. Admission: $7 per person, siblings under 7 months free. Location: 100 Vintage Way, Novato. Event details. Colorful dots cavort and juggle onstage, while audience members take an ever-changing, magical journey with the actors in this original production of Press Here the Musical, inspired by Hervé Tullet's award-winning picture book, Press Here, about the power of imagination and interactivity. Great for all ages, 3 and up. Tickets: adults $30 and $26 children (ages 2–14) and seniors $28 (65+). Purchase tickets here. Location: 2055 Center Street, Berkeley. Event details. We are so excited for our annual Egg Hunt! This year will feature a bake sale, food and local business vendors, prizes, games, bounce houses, crafts, face painter, hair braider and live animals! Egg Hunt for ages 0-5. While the egg hunts will be limited to children ages 0-5, there will be plenty of other activities for the whole family. Egg Hunt schedule coming soon! Location: 1008 G Street, Petaluma. Event details. Did you know you don’t need a wand to cast a spell? Think about the magical powers of music! Even without pictures, music can paint colorful stories in our minds, make us feel different emotions, and transport us to a different time and place. Join us for a concert that is all about magic and myths--you’ll hear the music of Harry Potter as well as the thrilling Russian tale of The Firebird. Recommended for ages 5 and older. Tickets start at $7.50 and up. Purchase tickets here. Location: 201 Van Ness, San Francisco. Event details. Megan is a children's music teacher, performer, and recording artist, offering classes and events across the north bay and San Francisco. She graduated from the Berklee College of Music in Boston with a degree in music therapy. Free. Learn more about Megan at www.musictimewithmegan.com. Event details. Celebrate the beginning of spring and wine grape growing season in Napa Valley! The Spring Bud Break Festival is fun for the whole family and features our annual Easter Egg Hunt as well as seasonal food and libations, kids’ activities, music, shopping, and more. Admission to the event is free, but can purchase food and drink. Location: 500 1st Street. Napa. Event details. Using the songs created by the most iconic musicians in rock history, The Rock and Roll Playhouse offers its core audience of babies and kids games, movement, and stories and an opportunity to rock out. The Rock and Roll Playhouse is an early and often first introduction to a child's lifelong journey with live music and rock and roll. Tickets: $17.50. Purchase tickets here. Location: 2036 University Avenue, Berkeley. Event details. Come enjoy Off the Grid’s delicious mobile gourmet food market on Sundays. Eat your way through the largest gathering of mobile food trucks in Marin, listen to live music, and take in great views of the bay and Mt. Tam. Location: 2257 Larkspur Landing Circle, Larkspur Landing. Event details. Presidio Picnic is a great family event that takes place Sundays on the Presidio’s beautiful Main Parade Ground, a seven-acre lawn with views of the park, the city, and the San Francisco Bay. Presidio Picnic features a rotating lineup of 30+ international mobile food creators, ​free yoga class, free Presidio Y Bike learn to ride lessons for kids on the first Sunday of the month, a cultural dance program every 4th Sunday, and more. For more info, visit their website.